Are you running out of gift ideas? Down to the last hard-to-shop-for people on your list like clients or in-laws?! We have you covered!! Outdoor wreaths make great gifts. We have different shapes, sizes, and greenery to choose from. Boxwood, Oregonia, Magnolia, Pine and more! The wreaths are undecorated so that we can help you put together the perfect combination to suit the style of the home. Our designers can make something beautiful and unique for you or someone on your list! Long lasting arrangements! The wintery months give us so many different varieties of long lasting greenery and florals to work with. 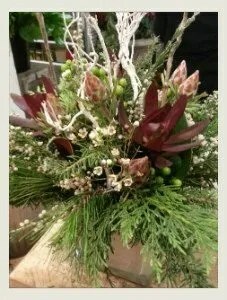 We make these arrangements to order, using the freshest items in store. We have a variety of vases and pots to choose from, or you can bring us your favourite container and we can fill it for you! 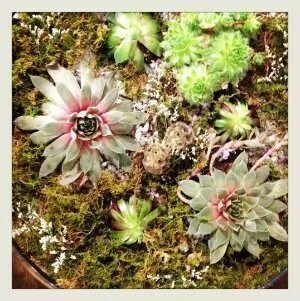 “Build Your Own Terrarium” kits are a really fun gift. We have everything you need including great advice! Succulents, air plants, fairy plants, moss, rocks and a variety of glass terrarium homes for your creations are all available! For any of these gifts, call us to order or inquire at 613-729-6911. Hopefully we have helped you check off a few more people from your list.